Lucky Streak 1 is the first iteration in the series of games produced by Endorphina sharing the same name and game mechanics. 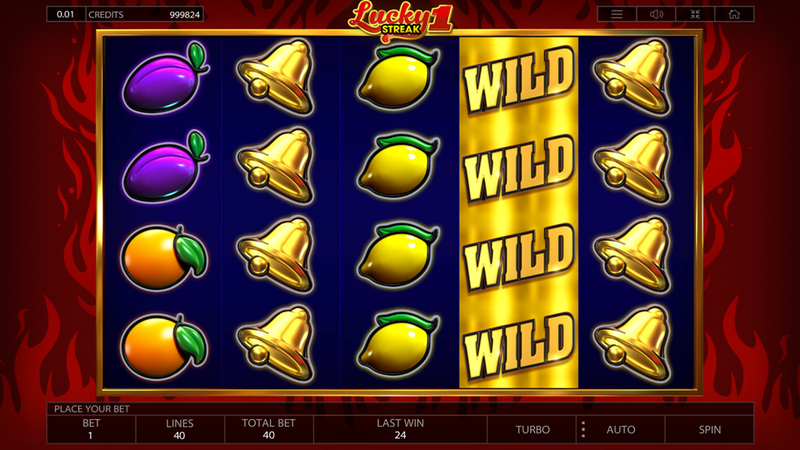 Built on the base with 5 reels, 4 rows, and 40 active paylines, this classic fruity slot machine comes with Wilds, Scatters and a static jackpot prize of no less than 20.000 coins. Find out all the important details in the Lucky Streak 1 slot review. A screenshot is worth a thousand words, right? Here you go! But in the end, you have to try Lucky Streak 1 yourself – one of the recommended casino sites should fit perfectly! Start with a standard decision, meaning that you can play for fun or for real money. For the first case scenario where everybody can learn how to win at no extra cost, we bring the good news: the Lucky Streak 1 Free Play has tons of demo credits for this very purpose. The game puts a simple task in front of a player: align 3 or more symbols of the same kind on adjacent payline from the leftmost and receive a payout. The paytable is crowded with items often associated with fruity slot machines such as Plums, Cherries, Oranges, Lemons, Melons, and Grapes. Their payout rating is slightly lower than Sevens and Bells have, so you have to satisfy with 8 to 200 coins for combinations of 3 to 5 of a kind. On the other side, you can receive 4, 60, 20 or 1000 coins for 2, 3, 4 or 5 Sevens and a maximum of 300 coins for 5 golden Bells. Golden Star works as the Scatter, but it won’t actually turn on any Lucky Streak 1 Free Spins. Instead, collect 3, 4 or 5 Scatters and claim the Lucky Streak 1 Bonus prize of 80, 800 or 20.000 coins, respectively. The coin value goes from as low as €0.01 up to €1 and you can place 1-10 coins per 1-40 lines, according to your betting strategy. In total, the game comes with a minimum bet of €0.01 and a maximum of €400 per round. Wild can replace all other symbols but the Scatter and help you form a winning combination, even though has no specific prize associated with itself. After each winning round, the winners can turn on the Gamble feature and try to double the winnings up to 10x. Choose a card from 4 dealt face down and you beat the dealer’s card, move on to the next round. Remember the game ends the first time when dealer beats your card. 3. What is the RTP factor of Lucky Streak 1? According to official info announced by the publisher, the RTP stands at 96.00%. The Lucky Streak 1 recension proved this figure to be correct. A modern classic with a sizeable jackpot prize is something that both newbies and high rollers will appreciate. As the house has a starting advantage, the Lucky Streak 1 tips presented here will surely be your best friend on the road to the top.